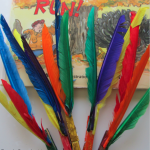 Since we made it past Halloween it is time to share ideas from one of my favorite holidays, Thanksgiving! 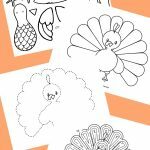 This is such a cool thanksgiving activity for kids: Food Scratch Off Cards! This will keep kids excited during the meal! 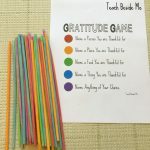 Because the entire sheet is laminated and the scratch-offs are so easy to recreate, these printables can be reused year after year! 1. Print and laminate the scratch-offs. 2. Create your scratch-off paint by mixing a 2:1 ratio of acrylic paint and dish soap. It. For one printable, combine 2 tablespoons of paint and 1 tablespoon of dish soap. 3. Paint over each photo. It is ok to paint outside the edges, because after the paint dries, you can easily reshape the rectangle (see step 4). 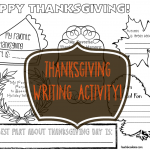 Want More Thanksgiving Activity Ideas for your Kids?